It looked like Syracuse (16-7, 7-3 ACC) was dead in the water. The Orange trailed 36-14 with 5:58 to go in the first half. Florida State (17-5, 5-4 ACC) was in the midst of a dominant 30-7 run, SU had missed six of its last seven shots, was 1-7 from beyond the arc and 1-4 from the free throw line. Oh, how the tides can turn in six minutes. SU ended the half on a 17-4 run to cut the FSU lead to just eight at halftime and then clawed its way back to draw within one in the second half, but that’s as close as the Orange would get as FSU closed the game on an 34-17 run in the final 14 minutes to down SU 80-62. They say basketball is a game of runs and this one showed exactly why. Just when you thought Syracuse had dug themselves into a whole and were up against an insurmountable deficit, the Orange came storming back. Then, just when you thought SU was on the verge of taking the lead, the pendulum swung back the way of the Seminoles and a very athletic, physical and talented FSU squad, walked away with what ended up being an easy win. But, let’s talk about that furious SU comeback in the first half because it was beautiful to watch. Tyus Battle scored 16 of his team-high 21 points in the first half and the guy just looked flat-out unstoppable. The junior went 6-for-9 from the floor and was aggressive off the dribble and in transition. He blew by a very talented and aggressive Florida State defense and made it look easy. When the drive wasn’t there, he’d pull up for that silky midrange jumper and even went 1-for-2 from downtown. His first-half performance was a far cry from the 6-point effort he put together against Pitt on Saturday and Jim Boeheim acknowledged how important Tyus is to the team’s success. Buddy Boeheim echoed his dad’s sentiment. The key phrase of that statement from Buddy though was, “in the first half,” because Battle was not nearly as effective after the break. He scored just 7 points on 2-of-6 shooting in the second half and turned the ball over twice down the stretch. Florida State figured out how to limit his effectiveness with an up-tempo pressure defense that SU on which SU could never quite get a handle. It was still one of your classic “Tyus Takeover” games in which he was clearly the star of the show, so you certainly can’t place the blame on him. You might, however be able to look to the supporting cast. Only three other players not named Battle scored for Syracuse. Oshae Brissett notched his second consecutive double-double with 16 points and 12 rebounds. Elijah Hughes poured in 17 but shot just 4-12 from the field and Buddy Boeheim chipped in 6 points off the bench. That’s just not going to get the job done against a top-25 team like Florida State and Jim Boeheim was not pleased. Boeheim also credited FSU’s defense with making things challenging for all four guards that saw playing time (Battle, Howard, Buddy and Jalen Carey), but wanted to see a change from his senior floor general. SU also struggled mightily defending the three-ball. FSU knocked down 11 of its 22 shots from beyond the arc, despite shooting 33% from distance on the season coming into the game. Early on it felt like that was something SU thought that they could give to the Seminoles to limit other parts of their offense, but it quickly became apparent that the ‘Noles weren’t going to cool off. It wasn’t all bad for Syracuse, though. They did trim a 22-point deficit all the way to one, after all and that was thanks in large part to turning to the press when they got down big. 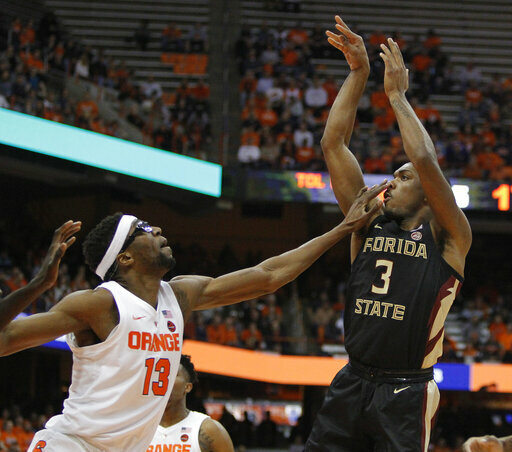 The Orange wound up forcing the ‘Noles into 21 turnovers and the activity and intensity of the press was a big reason why. But at the end of the day, the Orange just dug themselves into too big of a hole to climb out of. Now it’s a matter of regrouping for Syracuse and the Orange get a few days to do so before they welcome Boston College to the Dome on Saturday. SU is 1-0 against the Eagles after they ran by them in a competitive game in Chestnut Hill, MA last Wednesday. It’s a 2:00 p.m. tipoff in the Dome this weekend and we’ll have all your coverage here at orangefizz.net as well as on Twitter @OrangeFizz in what Orange fans hope is a more complete, team effort.